Here is a quick update on the upcoming Comex’s jailbreak for iPhone 4 and iOS 4 / 4.0.1. It was only yesterday when we informed you all that Comex in an interview said that he is “almost” done with the jailbreak and now he is waiting for Saurik (the creator of Cydia) to complete the last bits which are required for the jailbreak. 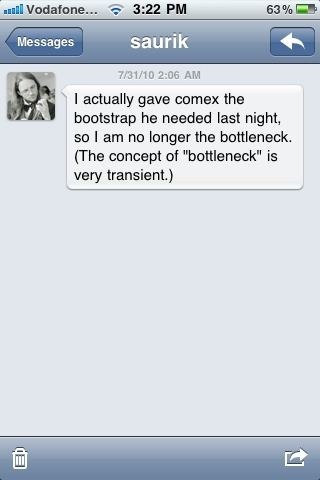 You will have to ask Saurik if he’s done with that bootstrap yet. Like I hate to say this because people will be complaining, but it is pretty close to done. So there you go.. If I read that right, we are probably now closer to the release than ever before. It seems like the new jailbreak tool is now going through final release mechanics before it is released to public. the message was sent on Twitter it even says it above the picture. Hi! I’ve made a mistake and upgraded to 4.0.2 (iphone 4)!!! Any news about this jb? IOS 4.1 is out on wednesday 8th sept. Hopefully comex and co will get a jailbreak released as soon as possible.